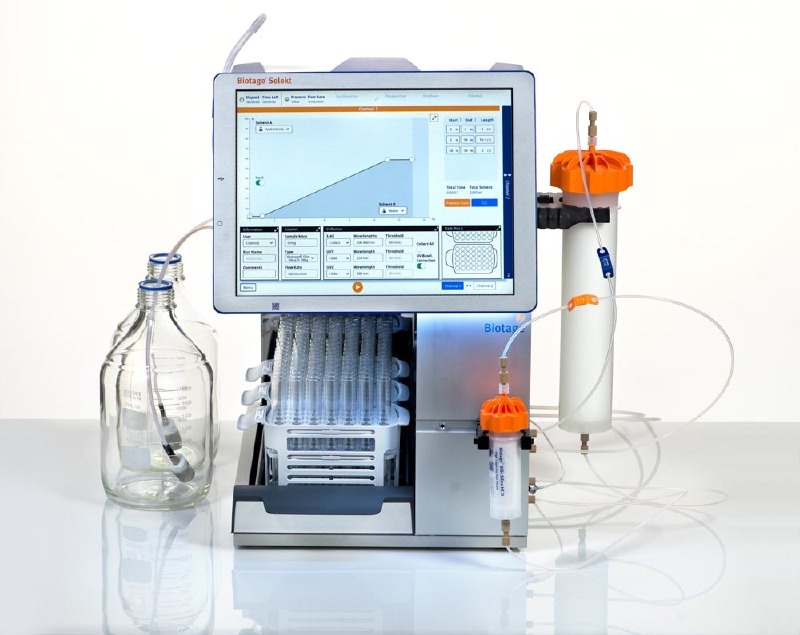 Biotage, a leading supplier of solutions and technology for analytical, medicinal and peptide chemistry, has launched Biotage Selekt, a new flash purification system and the new Biotage Sfär family of flash purification columns. Together these two new products provide both organic and peptide chemists the opportunity to improve their separations. The new flash purification system is a very compact instrument with a small bench top footprint.­ The new columns can be mounted either on the side or on the front of the instrument, again saving space in the laboratory. The instrument's high flow and the high-pressure capability enables purification to be performed at a faster rate. Other features also help to increase the rate of purification whilst reducing solvent usage. Biotage Selekt features a large touchscreen with a completely redesigned and flexible interface, ensuring that the intuitive controls are easy to use and reducing the time needed for training. In parallel with the new system comes Biotage Sfär, a new portfolio of flash purification columns with various media and sizes ranging from 5g to 350g. These columns use spherical silica with a high surface area and consequently a higher loading capacity, enabling chemists to select a smaller column to perform the same separation, reducing both the amount of solvent used and the cost of the separation. The new columns are flexible, chemists can liquid or dry load the columns as they wish, as with the current columns. The new columns can be opened, and used in conjunction with Biotage Samplet cartridges for optimum chromatography.